Neldris Llervu is a Dunmer witchhunter who wanders the streets of Suran. He is a sleeper for the Sixth House, and if you spot him at night, he will greet you with a message from Dagoth Ur. If you slay Dagoth Hlevul in Assemanu, he will awaken from his trance. Ask him about "Sixth House" and you will earn a point of Reputation. Neldris wears a netch leather cuirass with matching greaves, pauldrons, gauntlets, and boots along with a common shirt with a matching pair of pants. He carries a steel crossbow supplemented by 12 steel bolts. Aside from his natural resistance to fire and the sanctuary provided by his ancestors, he knows the following spells: Telekinesis, Recall, Mark, Divine Intervention, Almsivi Intervention, Bone Guard, Summon Ancestral Ghost, Ghost Guard, Bound Shield, Bound Boots, Bound Gauntlets, Bound Cuirass, Saintly Word, Saintly Touch, and Blessed Word. 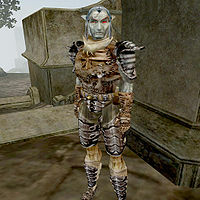 Due to an error in Neldris' dialogue it is possible to repeatedly receive Reputation points each time you mention Sixth House to him, after you have saved him from Dagoth Ur's influence. This only works if you saved Neldris by killing Dagoth Hlevul (instead of finishing the main quest). Once you complete the main quest, the glitch no longer works. This page was last modified on 23 November 2018, at 06:09.